We are all familiar with operator assisted conference calls. We’ve joined them and waited for our turn to give our information before gaining access to the call. For a long time, operator assistance has helped large event coordinators welcome and sort participants calling in, while also gathering their information as a way of tracking who is in attendance. While operator assistance is still a necessary component for tracking conference attendees, it is no longer the most efficient way for participants with access to a computer or mobile app to join. With EventMeet, Compunetix’s premier event conferencing application, participants can easily join calls on their own without compromising event organizers need to gather information about those joining the call. For large scale, operator assisted calls, it is not uncommon to get backed up in a queue of participants trying to join the call. EventMeet gives participants the ability to easily and efficiently join meetings, saving time for themselves while also freeing up the operator queue for participants who cannot access via a mobile app or otherwise. As displayed below, once the browser or web application is accessed, the participant will enter the requested information before being prompted to either dial into the call, have the conference bridge dial out to them, or join via computer audio. 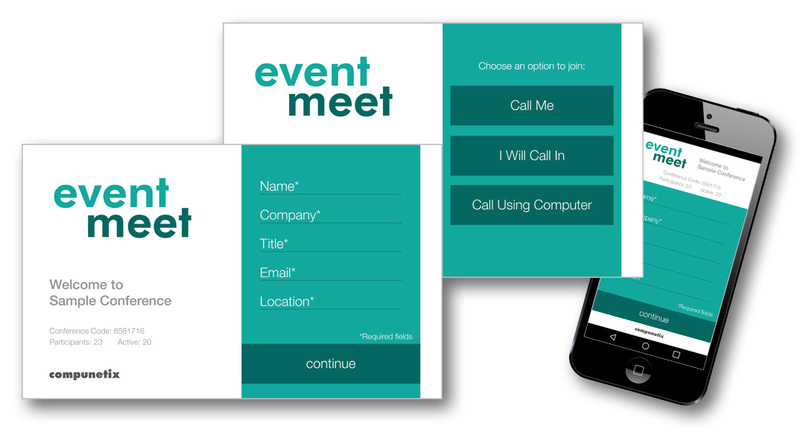 EventMeet also has the ability to be customized to your specific event or brand. From logos to color schemes, our marketing and design teams can make the application look like your own, creating a familiar and seamless user experience for your participants. Click here for more informationabout EventMeet.